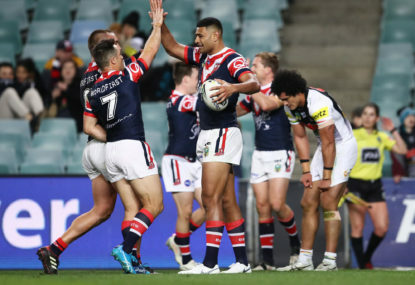 The Roosters proved their premiership credentials on Friday night with a win built on staunch defence as Souths dominated field position but couldn’t deliver the killer blow. The hosts set up a grandstand finish when Braidon Burns flicked a pass behind his back for Hymel Hunt to cross and peel their deficit back to four with 15 on the clock. When asked if his side were now premiership favourites, Robinson said: “No. “It can’t change within a night. We haven’t been there all year. Seibold said it was unclear how long Johnston would be out for but admitted his side were battling with injuries in their outside backs. “We’re a little bit under the pump at the moment with Greg Inglis and Rob Jennings and Campbell Graham all injured and now Alex,” Seibold said. “Adam Doueihi is included as well, he’s out for the year. I was really happy with our depth. Skipper Inglis is expected to return from a broken thumb against Brisbane next week but Seibold said he was no certainty.